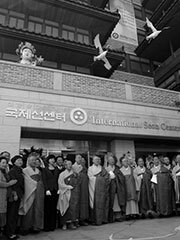 The Seon school is a Korean branch of Buddhism whose origins are from Chinese Chan and whose influence originated aspects of Japanese Zen. Chan was gradually transmitted into Korea during the late Silla period (8th and 9th centuries) as Korean monks of predominantly Hwaeom 華嚴 and Consciousness-only 唯識 background began to travel to China to learn the newly developing tradition. Then this tradition was passed on to Japan by Korean monks. The first transmission of Chan into Korea is attributed to a monk named Peomnang 法朗, but he was soon followed by a throng of Seon students, who later returned to Korea to establish the «nine mountain» 九山 schools, with «nine mountains» becoming a nickname for Korean Seon which survives down to the present. Korean Seon received its most significant impetus and consolidation from the Goryeo monk Jinul 知訥, who established the Songgwangsa 松廣寺 as a new center of pure practice. It is from the time of Jinul that the predominant single meditational sect in Korea becomes the Jogye 曹溪, which survives down to the present in basically the same status. Toward the end of the Goryeo and during the Joseon period the Jogye school would first be combined with the scholarly 教 schools, and then be relegated to lesser influence in ruling clas circles by Confucian influenced polity, even as it retained strength outside the cities and among the rural populations, and ascetic monks in mountain refuges. Nonetheless, there would be a series of important teachers during the next several centuries, such as Hyegeun 慧勤, Taego 太古, Gihwa 己和 and Hyujeong 休靜, who continued to developed the basic mold of Korean meditational Buddhism established by Jinul. Seon continues to be practiced in Korea today at a number of major monastic centers, as well as being taught at Dongguk University which has a major of studies in this religion. Seon, Switzerland for the municipality in Aargau, Switzerland.